These seeds are incredible! We proudly offer heirloom veggie, flower, fruit & nut tree seeds. All open pollinated; no GMO seeds here! Bare-root berry bushes coming soon! Our off-grid farm and gardens are on Nova Scotia's South Shore. We put up a double batch of this salsa last weekend and it was delicious - and the flavours will only improve over time! With salsa, sometimes simple is best. This is a classic all-natural recipe that has been tested as safe for hot water processing. 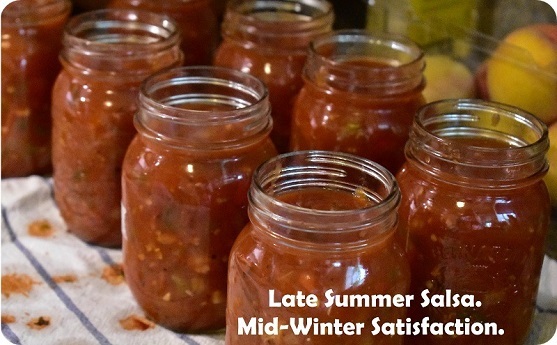 Salsa is a great way to use up that avalanche of tomatoes that comes through the door at this time of year! If you plan/plant things right, you can grow ALL the ingredients for this salsa right in your own garden. Happy canning! Happy eating. 1. In a large stainless steel stockpot, combine all the ingredients. Bring to a boil over medium-high heat, stirring to prevent scorching. 2. Reduce heat and boil gently until thickened, about 30 minutes. Continue to stir. 3. Prepare canner, jar, and lids. 4. Ladle hot salsa into hot jars, leaving ½ inch headspace. Wipe rim and attached lids. 5. Place jars in canner, covering by at least 1-inch and bring to a boil. Process for 20 minutes, then remove jars to cool on a towel-lined surface for 12-24 hours. Check seals before labeling and storing. How amazing will it be to pull a jar of summer flavours off your pantry shelf this winter? Enjoy! Please note, comments must be approved before they are published. Subscribe to our newsletter & library posts!